From the first digital games of the 1960s to the multisensory interactions of today, video games have represented the pinnacle of human-computer interactions—a medium that is able to listen to the input of its operator and adjust with an array of interesting decisions. As players engage those decisions, they jointly and individually influence the form and content of what is eventually displayed on-screen. This requirement of co-creation between the player and the program is what makes video games among the most culturally, economically, and socially successful media. At the same time, co-creation can be a demanding process, as it requires engagement of the player’s cognitive, emotional, physical, and even social resources. 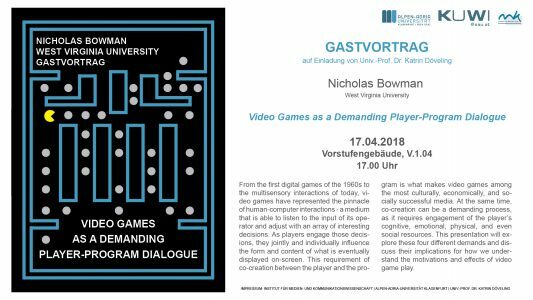 This presentation will explore these four different demands and discuss their implications for how we understand the motivations and effects of video game play.